Casting directors of the world, take note. 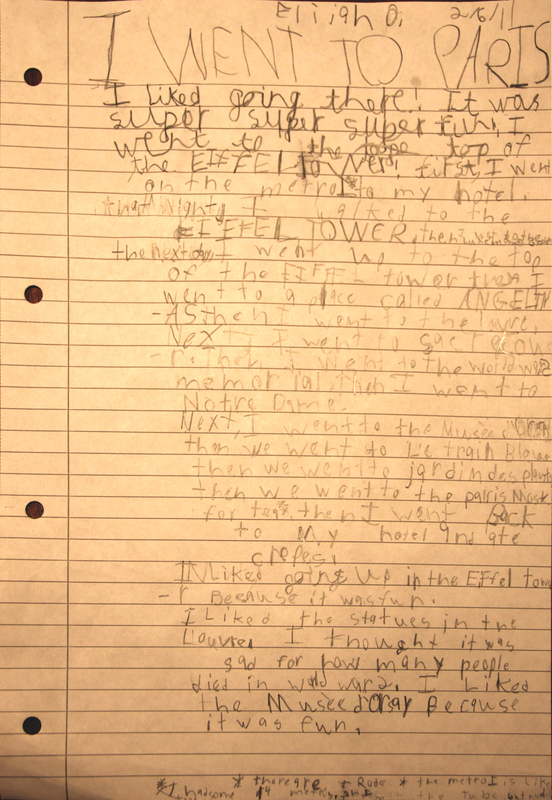 In associated news, Eli’s blog entries concerning his trip to Dickens World and the Olympic Site should be posted later this week / the beginning of next (i.e. when next I have time). I hope to find a clever way to post his new 12 page epic– “Transportation: On Ground And Air”– but for today, I will post his transport-concerned ‘research paper.’ (This entire semester has been themed with transportation, BTW; Eli couldn’t have asked for better!) As with his themes summarizing the educational daytrips we’ve been going on, I will post an image of his original work, followed by a transcription. 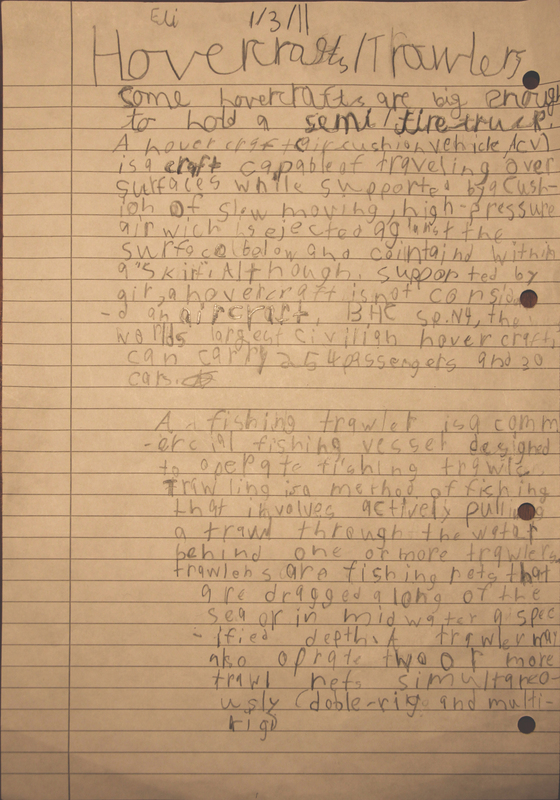 To that end, allow me to present Eli’s first ‘research paper,’ entitled “Hovercrafts / Trawlers.” Before you read, all academics who peruse will please take note that, yes, a) this is quoted directly from the source without citation and b) his primary source is Wikipedia. This was per teachers’ instruction, and seems perfectly reasonable for Year 3 (2nd Grade). When he continues to do this in High School, and bases all of his critical response papers on not-so-clever re-wordings of CliffsNotes, please feel free to heap on the derision. This qualifies as Eli’s seventh post in the series. behind one or more trawlers. As recapped many times before, we have asked Eli to summarize the educational daytrips we’ve been going on by writing a short theme. I am then posting an image and a transcription of each theme as a blog post. 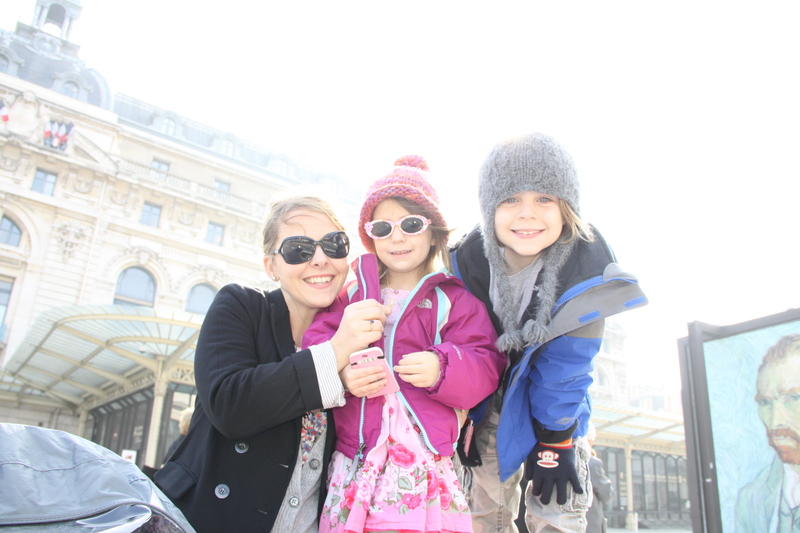 Allow me to present Eli’s version of our trip to Paris– don’t worry, his is shorter! This is Eli’s fifth post in the series. on the metro* to my hotel. EIFFEL TOWER. then i went to the Luxembourg Gardens. -AS, then I went to the louvre. then we went to the pairis Mosk. -r Because it was fun. * there are 14 metros [lines]. I rode on 4. The metro is like the tube, but numbered [instead of the lines being named]. ** I had some too! The fifth part of the EPIC Paris travelogue commences here. Who knew that one week of vacation could take more than one month to recount? (Okay, maybe I DID sort of “worst-case-scenario” that when I started writing.) Makes you think of those cliche 60’s era 35mm slideshows that annoying neighbors were supposed to always want you to come over & watch… “and this is us arriving in Paris. 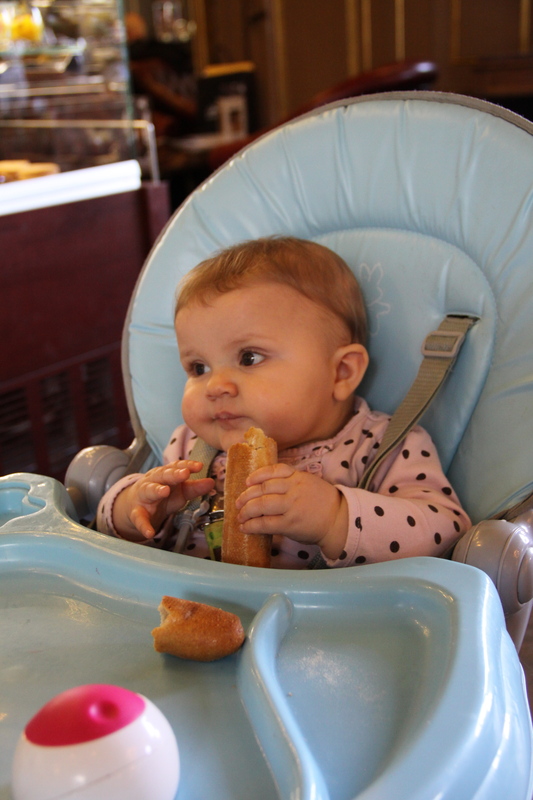 And this is our first taste of Bread in Paris. And this is us at a Museum in Paris, looking at the art while eating Bread. And here we are at the Museum of Bread in Paris. And here we are, thinking about the beauties of Paris– it’s incredible– while eating Bread, and going to a Museum”… But hey (silver lining on the cloud) at least now the multi-part series has come to an end. Part Of The Musée d'Orsay... "The Only Trains You'll See There Now Are IN The Paintings!" Sadly, Eli Missed The "Sunglasses" Memo. 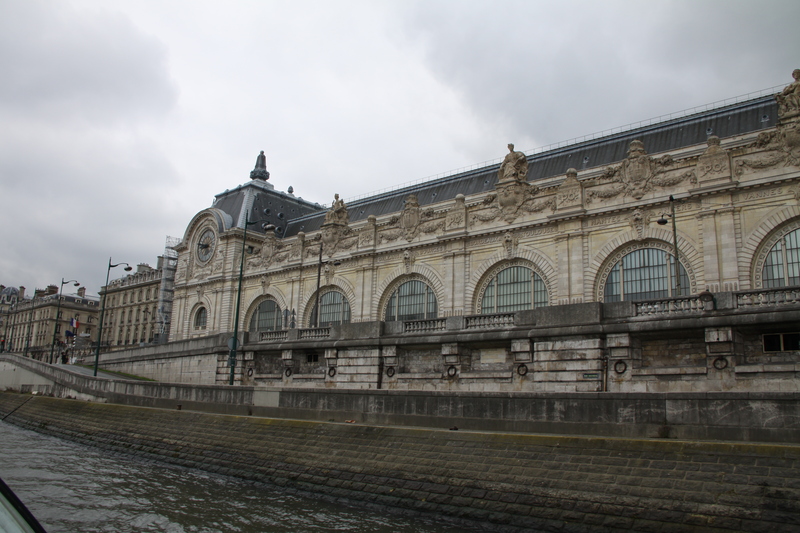 We left Musée d’Orsay and took the RER for the first time. The RER (Réseau Express Régional) is a part of the Parisian public transit system created mostly to service commuters from the Parisian suburbs (I think). Additionally, RER connects Paris and the outlying facilities and attractions (airports, Euro Disneyland, etc) of Île-de-France. Someone on TripAdvisor said to “think of the RER within Paris as the ‘express’ with fewer lines and fewer stops across the city and the Métro as the ‘local’.” We hadn’t been in a position to use it before, but there is a RER stop immediately outside the Musée d’Orsay… plus, it seemed like it was going to take multiple stops & three line changes if we used the Métro. So we went. It IS similar to the Métro, but scaled up; it also seems, I dunno, dated. Maybe it’s because the Métro seems so classy in comparison, with all the white tile and Art Nouveau metalwork? Not sure. The train tunnels are definitely bigger (like, size HUGE; given the tunnel sizes, it’s definitely RER stations that I remember from that Luc Besson / Christopher Lambert gem– that ALL-TIME movie CLASSIC– 1985’s “Subway“! ), and the trains are very frequent… allow me to quote from Wikipedia: “one of the world’s most advanced traffic control systems… enables extremely short spacing between trains during rush hour (under 90 seconds in stations, under 2 minutes in tunnels). Parisians have become used to the sight of a train pulling into a station as the one before it is just clearing the platform.” I was really glad we weren’t using it during rush hour, as a) it was nice to perch the stroller on the interior landing (the cars are bi-level) and b) the thought of a train pulling is AS A TRAIN PULLS OUT makes me (hardened subway user of many years that I am)… uhhhhm… queasy. All that to the side, it was a comfortable ride (Eli got to sit on the top level, much to his joy), and with limited stops, very fast. Of course, only the first minute or so of this clip is representative of our experience. No-one was gunned down in the course of the meal. Our waiter was exactly as my father had described– incredibly helpful and kind– and his ministrations probably kept us in our chairs an hour longer than would’ve happened otherwise. They Were, In Fact, Aware Of The Beauty Of Their Surroundings. Not That You Would Guess It. Then a walk back across the Pont Charles-de-Gaulle to the Jardin des Plantes. Walking back and forth across the Pont was no laughing matter (this Pont, or any other). 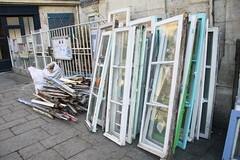 The wind we experienced in Paris was strongest each day, EVERY day, on the Seine. The wind was literally in our teeth on the way over, making my (as Eli likes to describe it) “Dr. Teeth” style gold molar feel like only bitingly cold dental work can. (Perhaps this is not as universal an experience as I assume… chalk that last comment up to “loquaciousness,” “eccentricity,” or some other forgivable personal shortcoming.) On the way back, we were so overburdened with food that the wind was less of a issue– it was maintaining momentum that was the challenge. We somehow rolled / dragged ourselves across the bridge, past the Gare d’Austerlitz (again), and into the Jardin. The Jardin des Plantes seems to be a huge botanical exhibit / garden (wiki backs me up here), with several museums, a menagerie, some large swaths of proper garden, a “sustainable planting” exhibit, and (at least whilst we were there) a LOT of children. Initially, we tried to get a look at the Galerie d’Anatomie Comparée’s new exhibit– including a giant squid!– to no avail (line was crazy long, and filled with rowdy schoolchildren) before settling on a carousel. (Ahhhh, Paris. 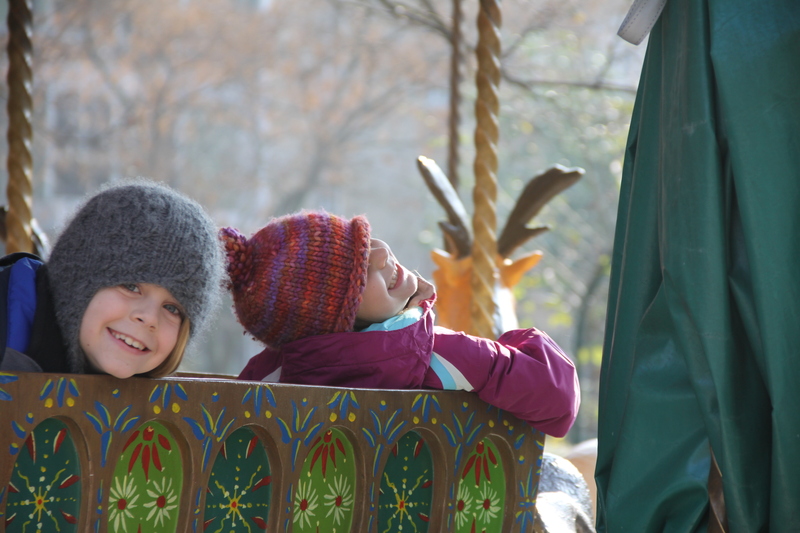 City of carousels.) 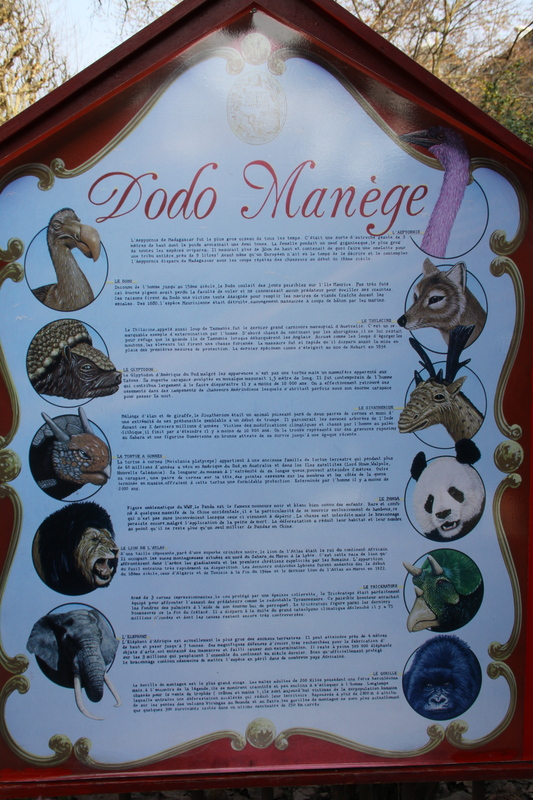 The design of this one was a bit cryptic– The Dodo Carousel, right outside the Galerie d’Anatomie Comparée— and we still don’t quite understand the manner and/or selection of beasts that you rode. The Carousel Had Crazy Animals. Please Note The One In The Pink Hat. The List Of Crazy Animals. Skilled French-speaking Friends, Eli Will Pay For A Translation. Then we walked across the park to a very busy play area, but blew THAT off when we saw how packed each toy was, and finally made an attempt to get in to the Grande Galerie de l’Évolution. We had heard really good things about this place; a visual representation of evolution through time, where “the centerpiece for the museum is a sort of Noah’s-Ark-like procession of taxidermied animals winding their way through the middle of the building.” Sounded super cool, Charles Darwin eat your heart out– BUT– the only feature we saw was an entry line around the building. Evidently, others had heard it was really cool to see a 3D representation of evolution, too. SO, we walked around the corner to the Grande Mosquée de Paris, and had tea– minty delicious. We didn’t penetrate very far into the mosque, but we made it further than many. The entrance way and exterior terrace was filled, to the brim, with people having tea and eating pastries– but, just a bit further in, past the dessert stand, (using the stroller to forge a way through the crowd like Recondo from G.I . Joe wielding his machete) there was a tiled and canopied courtyard with many tables where we took our leisure. A waiter regularly does the rounds with trays filled with small glasses of piping hot sweet mint tea– we ended up buying two rounds. Birds manage to penetrate under the white canopy– in fact there are feeders for them, and there are trees growing through the canopy which give them purchase– but a suspicious lack of bird poo. A Delightful Place To Drink Mint Tea. I should mention, at this point, that the children have become very good at dodging questionable piles of might-be-excrement on the streets of London, and that this skill also served, to a lesser extent on the streets of Paris– but somehow this courtyard was bereft of any casual decoration by our winged companions. We (the adults) needed this tea to further recover from the wonderful (but unending) at Le Train Bleu, the final course of which was responsible for something I had heretofore thought was impossible– Lana felt that she had hit “the cheese wall,” and had to stop eating La Fromage. As the French say, quel dommage! 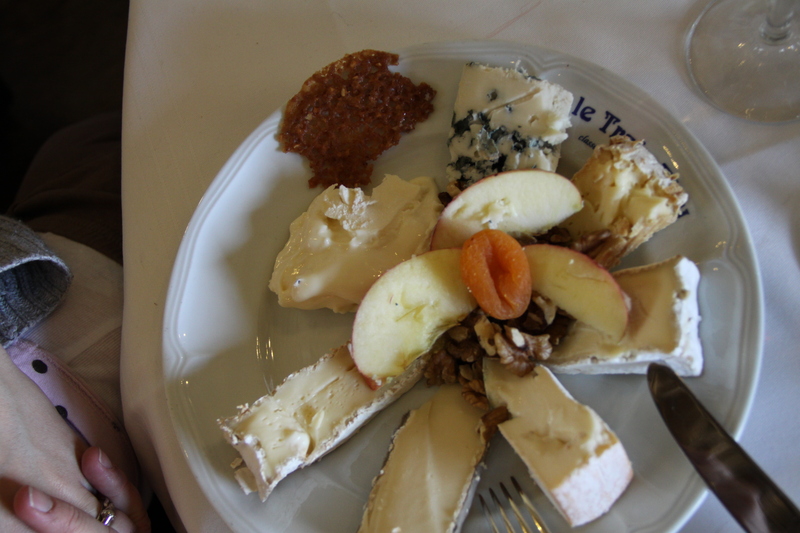 Lana's Cheese Plate At Le Train Bleu... HERE BE THE FOOT OF THE "CHEESE WALL"
While in Paris be sure to try to see the Jacquemart-André Museum in the 8th Arrondissement. A fabulous “townhouse” (mansion) built 1869-75 and filled with fabulous art from around the world purchased by the owners. Husband… and his famous portrait painting wife traveled the world spending “Daddy’s” money on the most wonderful of art. During the tour it is implied that it was “perhaps” a “marriage of convenience”…what do YOU think!? Anyway…do try to see it if you have time. It’s certainly not one of the handful of “must do’s” while in Paris but out of all my many trips it is a standout. A good cafe/tearoom attached as I recall! Also the house/mansion is fitted with moveable/tracking walls (VERY au courant for the time)…kind of a “gadget queen” he was. –which seemed AWESOME. 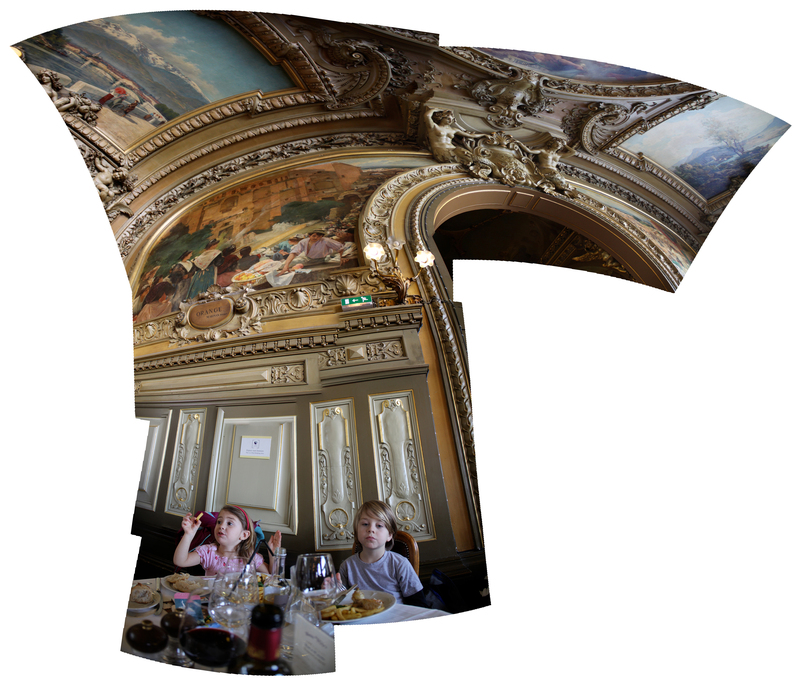 BUT (and it is a big but), AS we had done many things that day, and AS we didn’t have a specific work we could point to at the Musée to get the kids interested (like Degas‘ dancers or Van Gogh‘s Starry Night), we thought we would save that for next time, with older children. (Or, hey, with a fourth child, which has been discussed. My current thought is “does a boat need more anchors than sails?” but the idea merits consideration, certainly.) At any rate, we decided on returning home, with the caveat that IF the new giant squid exhibit had a reduced line, we would take a look at Architeuthis in it’s new home… Sadly, they had stopped admission to the Galerie d’Anatomie Comparée for the day, as they had reached capacity MUCH earlier. So, we went home. You will perhaps recall that earlier Finley had decided that she didn’t trust crêpes. On this particular night, our last in Paris, we decided to eat crêpes as a meal. Excessive? Perhaps. But, as 007 has taught us, You Only Live Twice (You only live twice / Once when you’re born / And once when you look a dinner entirely of crêpes in the face.) We seeded the ground with Finley by telling her that we were having French pancakes for dinner (which is obviously a completely accurate statement). 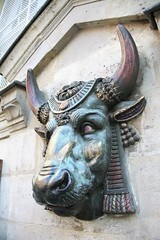 I then headed out to a crêperie that we had noticed by our hotel on the first day there– Crêperie A l’Etoile d’Or. It looked pretty damn cool on the outside, the equivalent of a Home Depot shed attached to the side of a building, if the builders had been 19th century Frenchmen, and Home Depot had been allowed to flourish under Baron Haussmann. It was a curious structure anyway, as I had pre-supposed it to be quite small inside; when I went in pursuit of the host, however, I found that it enervated the building it had seemed to be leaning against quite deeply. At any rate, I ordered 4 beurre sucre crêpes, and 2 caramel au beurre salé… When I returned home with the goods, I attempted to crack open the remains of the previous days cheese, preserved in the fridge… And was told by Lana to “take that $#!! to the other side of the room!” Obviously, the cheese wall still had her in it’s shadow. However, a crêpe convert was found in Finley. She declared in absolute terms that crêpes were all she wanted to eat for the rest of her life. At which point, we figured that our work in Europe was done.